Now that we’re living in a post-ban world, I’m ready to do another financial deck tech for players new and old looking to change up their Modern deck. This time I’m going to try not to touch decks that are likely to be affected by the newest bans because there is likely too much churn in their lists to be accurate at the moment. Instead we’ll be breaking down one of Modern’s longest-standing and storied aggressive decks: Burn. Burn is a very versatile deck that can be played most basically by those unfamiliar with the format, but that still rewards veterans with deep knowledge. Its plan and end goal are usually pretty easy to figure out in any given game, even if the details of execution can differentiate a competent pilot from a master. It functions similar to Affinity as it has the speed to beat the less interactive decks soundly. Burn, however, is not nearly as susceptible to game-ending sideboard cards like Affinity can be. It’s a pretty good choice for a local card shop because it’s difficult to hate out and pretty resilient against metagame shifts. I think it’s definitely one of the best decks you could invest in when starting to play Modern. Burn at its essence is not a deck that really has any worries about future bannings. It’s a collection of the most efficient red spells in Modern with some minor sideboard tweaks. A lot of cards that are core to the current Burn deck are relatively recent additions from Journey into Nyx and Khans of Tarkir, but plenty of others have been around for quite some time. In any case, the fundamental interchangeability of the individual pieces means that even a banning would be unlikely to unseat the deck from the top tiers. As for future printings, any upgrades would most likely rely on the addition of brutally efficient red spells which, currently, Wizards of the Coast does not seem to want to print. Maybe we’ll see a shift in the beliefs of R&D and get some in the future, but I wouldn’t be terribly surprised one way or another. Regarding new hate pieces, I doubt we’ll see many more cards printed that can compete with the current anti-Burn suite available. It’s hard to beat the brutal efficiency of Kitchen Finks or the stickiness of Kor Firewalker, so I wouldn’t be too worried about having to live in a world where the opposition is much worse than those two. The core of a deck are those cards you absolutely need to play, where substitutions are likely impossible and copies of these cards are included almost universally across decklists. Burn is comprised largely of the most efficient damage-to-mana cost burn spells at every point on the curve, which leads to a large portion of the deck being the core. The cards that are most definitely part of the core of Burn are Goblin Guide, Monastery Swiftspear, Eidolon of the Great Revel, Lightning Bolt, Lava Spike, Boros Charm, Rift Bolt, and Searing Blaze. There are many other cards that will usually make the cut in lists that are of less interest to us here. With Burn there are a lot of cascades from one inclusion to the next. For example, if you play Wild Nacatl you’re also going to play Atarka’s Command. If you’re not playing Atarka’s Command then you’re probably playing Skullcrack. For our purposes, sideboard cards also don’t count as part of the core, despite almost every Burn deck finding room for at least one Deflecting Palm. The core of Burn is relatively inexpensive compared to the most optimal version that you may see a full price tag for. The 32 cards shared by most versions come to approximately $216, which includes 4 Goblin Guide ($35 each) at the top. While that number will look pretty similar to the Dredge deck that I talked about last time, there is a bit more money to be spent on a reasonable mana base. For the most technically optimal mana base, a mix of Zendikar and Onslaught fetches provide some marginal advantages—this costs even more, but generally isn’t necessary for the average player. At a minimum, you want to purchase the cards listed as the core above before going forward. Incremental upgrades can be made in the mana base after that. Far and away the best thing to buy first is Eidolon of the Great Revel. It’s from a small, under-purchased set at the tail end of a not-terribly-popular block. It has seen pretty steady growth on Magic Online since late December despite that trend not translating into any movement in the paper price. There is likely to be a correction if any Burn staples (like Goblin Guide) are reprinted in Modern Masters 2017. Eidolon has lost over half of its value since the release of Battle for Zendikar, and I’m expecting it to hit the bottom soon. After that, I would recommend making sure you have the cheapest commons and uncommons. Monastery Swiftspear was a $3 card while it was in Standard but can be found for about $2 now. If Frontier makes a big push and people need Swiftspears again, we could see the price rise a few more bucks. 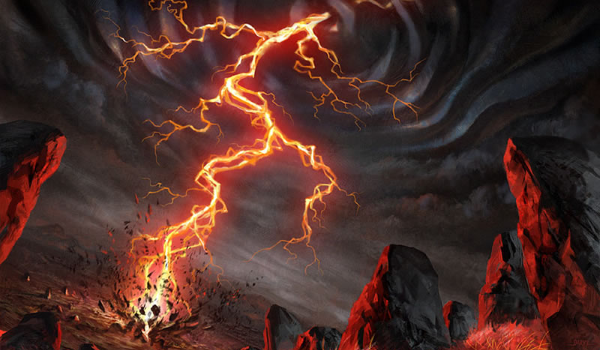 Lightning Bolt is a card most Modern players already own, but if you don’t, you don’t gain much by waiting. It’s a card much like Lightning Helix and Path to Exile that stubbornly refuses to decrease in price. It doesn’t matter how many times it gets reprinted; copies will always be a few dollars. Boros Charm is another card I would recommend picking up right away. The Commander 2016 copies can be picked up for less than $2 in most cases, and that’s near historic lows for that card. While it is eligible for a Modern Masters 2017 reprint, you really don’t have much to lose as it will still probably be at least $1. Searing Blaze is also in a similar place. Just spend $4 on the playset—it’s more likely to go up due to reprints of other cards than go down because it gets reprinted. The cards I would definitely wait on are Goblin Guide, Lava Spike, and Rift Bolt. 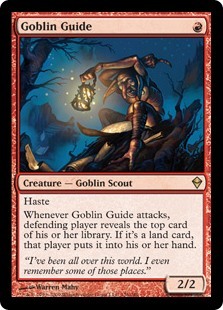 Goblin Guide seems like an obvious snub from Modern Masters 2015 that could easily be included in Modern Masters 2017. If it isn’t, there aren’t a ton of other cards holding back the deck’s price, so it’s unlikely to see a huge increase if you wait. 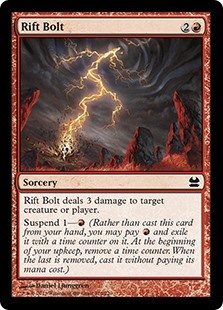 Lava Spike and Rift Bolt were both reprinted as commons in Modern Masters (2013) and dropped to a dollar before recovering most of their price tag today. Unlike Lightning Bolt, these cards have a lower floor and thus will be impacted more by a potential reprint. The last thing I recommend is getting at least 3 Sacred Foundry and at least 2 Stomping Ground. While they’re not really part of every core, you will want access to those cards in some circumstances, and getting them now seems like the best time for a while. When we finally get another wave of enemy-colored fetchland reprints (don’t worry, it’s coming eventually) the hardest lands to get will likely become shocklands. With the number that get eaten up by casual players in Commander decks, and Burn’s odd sensitivity to non-red mana, having access to these is a big deal. The Burn manabase is definitely the biggest compromise you can make while building the deck. Gerry played the most optimal version with 12 fetches over distinct card names (all of them find Mountain) which technically is the best way to build the mana. Having 3 copies of each of the four fetches instead of 4 copies of three fetches gives you some extra fractions of a percentage point against odd scenarios like Surgical Extraction and Pithing Needle. In practice, you may never even find yourself in a situation to lose a game for this reason, so it’s not necessary to play the deck. If you are playing Grim Lavamancers, I definitely recommend 12 fetches if you can afford to buy them. Starting with the 8 Khans of Tarkir fetchlands and extra Inspiring Vantages is definitely a reasonable substitute. 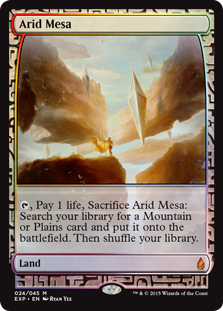 Arid Mesa is not as expensive as Scalding Tarn, but you still save $200 on the playset if you play slightly less optimal lands. If you don’t have the requisite fetches you can replace them with budget red-white duals. I wouldn’t recommend more than 1 Clifftop Retreat or more than 2 Battlefield Forge. The most important thing is that your lands come into play untapped—games can be won by the smallest margins, and almost any other downside is better than a tapped land. Finally, if you plan to play the Wild Nacatl version I would recommend investing in fetches first. Wild Nacatl is a pretty embarrassing card to be playing in Modern if you don’t have a Sacred Foundry in play, and you will need to find it with maximal efficiency to justify running the one-drop Cat. The first thing to think about is what kind of sideboard you need for the tournaments you’re planning to play in. Most people don’t travel for Star City Games Opens or Grand Prix, so a lot of what your sideboard looks like will be dependent on the popular decks in your area. As such it’s hard to point exactly where is the best to start, but Path to Exile is a card I definitely always have in my sideboard in some capacity. After that it really depends on your local metagame. Cards to consider are Wear // Tear, Destructive Revelry, Deflecting Palm, Smash to Smithereens, Ensnaring Bridge, Surgical Extraction, Skullcrack, Molten Rain, Kor Firewalker, and Gut Shot. With the exception of Surgical Extraction and Ensnaring Bridge, these cards are cheap and pretty easy to find. I wouldn’t recommend waiting if you anticipate needing them because their impact-to-cost ratio is pretty high. One of the strengths of a deck like Burn is that you have so many inexpensive sideboard options that allow you to easily tailor your deck without spending a ton of money. I’m sure everyone has seen Abzan and Jund players gushing for the past few weeks over Fatal Push, but there are other cards that are getting people excited too. Sram, Senior Edificer has a lot of players excited to get more Puresteel Paladins for their fringe Cheeri0s deck. Sram effectively gives you four more Puresteel Paladins, making the deck more consistent and quicker. While the increases won’t blow the lid off of any interests pages, the cards that are in low supply and high demand for that deck have been drying up and getting more expensive. Retract and Puresteel Paladin in particular seem to being enjoying this wave of hype, despite a decklist not materializing yet. If this type of deck excites you I would recommend buying in quickly as possible. By now the prices are probably too high to justify speculation, but for players I advise picking up your copies. Sram has also spawned a number of Standard decks that try to do a similar thing while winning with Aetherflux Reservoir and Paradoxical Outcome. With the release of Aether Revolt upon us, I am excited to see what happens in Standard and Modern. So far nothing too crazy emerged from SCG Columbus, but the post-ban format is still in its infancy. Meanwhile I hope you enjoyed this financial deck tech, and if there’s a deck you’d like me to cover next time, make sure to let me know in the comments! Glad to see a financial write up for my favorite deck in Modern! I pretty much agree with everything you said. I’m hoping for a Goblin Guide reprint in MM17 so that more people can share in the glory of counting to zero. I’m building a burn deck for legacy, but there is enough overlap of cards that this guide was able to help me out. Who knows, once that’s done maybe I will adjust it to modern.